The mobile app industry is expanding day by day, and with the one-million-app mark being achieved by late 2011, the competition to get your app noticed in the marketplace is quite keen. 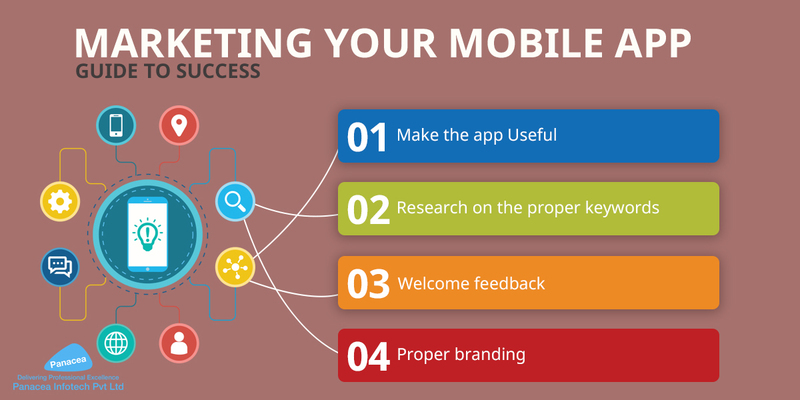 However, you have no reason to lose hope; provided you market your app quite perfectly, you truly have a world of chances to get the much-awaited success. However, a full-scale marketing plan can only go into force when you work strategically and methodically. The plan for marketing should get started way before it is launched. There are a number of factors that you must consider in the early stages of your app development, including branding, keywords, and competition. Well, the first criteria for the desired marketing success depend on how useful the application is. No matter how well you market your mobile app, it’s never going to come to your benefit unless it’s not something that people need. Your mobile app doesn’t have to be just an extension of your website or another version of your online store that would be of interest to only your current customers. You can just go inventive and come up with something that will attract the common people and put your brand name wide afloat. Having a proper keyword would always help your app get found. When you are launching a mobile app that, you feel, just has to be created, it’s also important to have the description on the download page. You should always find out who your main competitors are and look for proper keywords to see how they rank in the market. This is how you can also determine which category you should be placing your app under. Choosing the right category is difficult, and you will need to take a calculated risk. If your competition is fierce in one category, it may make more sense to choose another relevant category that was not your first choice but will get your app ranked higher and, therefore, more likely to be downloaded. Always try to welcome as much feedback you can. When it gives you the space for improvement, it also allows you to learn a number of things what might be really beneficial to the mobile app development services you are going to offer to your customers. Submitting your app to app review sites will increase your brand awareness, allowing potential clients to discover your app while they are reviewing similar apps or while they are searching for an app they are considering downloading. So, you should always steer your users towards reviewing your app after download. Positive app store reviews will build trust in prospects who are wondering whether to download your app, especially if the app is not free. Simultaneously, with a number of companies offering several free app creator programs, developing apps has become increasingly easy. But, clinging to any random strategy doesn’t make any sense. To gauge out the ideal way of creating apps, emphasizing on user feedback will certainly be one of the wisest acts from your end. Last but not the least; branding is something that represents you and your company the best. Your brand is what represents the status of your venture as well. Irrespective of the sector your business is dealing with, branding is truly important to pave in the way for success. So, when you are developing your app and designing your brand accordingly, you should always give a special emphasis on the name of your business, the style of the app and, most importantly, the icon that is going to represent you before the users. At the same time, your brand is how your clients will recognize you and connect with you. Quite true to the dictum,’ the first impression is the last impression’ -the primary impression your potential users will get your app and brand is directly reliant on the success of your venture. The positive remarks on your download page are what will convert the possible users into downloads. Panacea Infotech is one of the best mobile app development companies and has now become a digital partner of choice for many businesses across the world. Offering exclusive custom software development services, we have established ourselves as an ideal platform that covers everything from web development to IT consulting and outsourced product development to data analysis, cloud, and mobility. So, if you are on the lookout for some assistance in this regard, you can call us anytime you want or you can also reach us through our mail id.